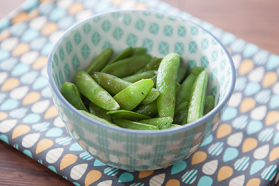 Place the sugar snap peas in a large bowl. Sprinkle with oil, soy sauce, salt and black pepper. Toss to coat. Place the peas on a metal baking sheet. Bake in a 400 degree oven for 8 to 10 minutes. Turn a couple times while roasting.